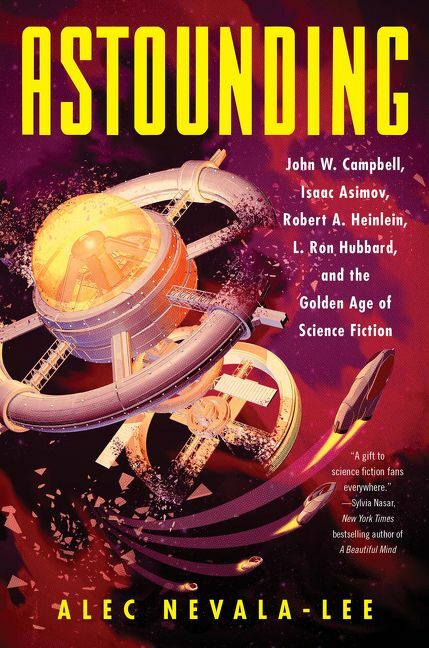 ASTOUNDING – John W. Campbell, Isaac Asimov, Robert Heinlein, L. Ron Hubbard and the Golden Age of Science Fiction by Alec Nevala-Lee, Day Street Books, October 2018 hardcover, 544 pages. I started reading reading Astounding Science Fiction in 1955, at age ten. I loved the covers, the stories, the interior illustrations (Kelly Freas was my favorite) and the book reviews. I completely ignored the editorial material, and generally skipped the fact article, unless it was by Willie Ley, whose articles on rockets I found interesting. But my focus was on the short stories and serialized longer works. I gobbled up every issue as it came in the mail. A few years later I discovered a used magazine store in downtown Los Angeles who sold back issues by the year, tied in twine. Over three visits I bought all of 1950 through 1954. I read and loved those issues too, again skipping the editorial content, in which I had no interest. For me, then Astounding was a fiction magazine, pure and simple. Though later I read both Galaxy and Fantasy & Science Fiction, Astounding remained my favorite up to and a little past the time it changed name its to Analog. When I heard about this book and read some reviews, I thought it would be just what I wanted: a book about the magazine and it’s editor’s influence on the SF of the decades 40s-50s-60s. This book is not that. The subtitle might indicate the author’s intentions, but with the word ASTOUNDING in caps at the head, I think the complete title is misleading. Certainly, there’s not really a lot about the golden age of science fiction. I was extremely disappointed. It was not at all what I wanted or expected. There is far, far too much focus on L. Ron Hubbard and his obsessions of Dianetics and, later, Scientology. The book also focuses on how haywire Campbell became under the influence of Hubbard. Deleting all of the Hubbard material from the book would have improved it greatly, as would have the inclusion of the many other authors who contributed to science fiction’s “golden age” through their contributions to the magazine. Too bad. Last week I finished reading Iron Lake by William Kent Krueger. I did enjoy it a lot and am looking for the next one to read. After that I read Never Go Back by Lee Child, the 18th Jack Reacher book, I think, but only the 3rd one I have read. That was good too. Not as much depth, though. Currently reading Harry Potter and the Deathly Hallows, having been inspired by Prashant last week to actually finish the series. I’m glad you enjoyed the Krueger. I have yet to read a Reacher, though Barbara has read them all, and after she caught up a few years ago has read each as it’s come out. She picked one for me to try, but I haven’t gotten to it yet. I read the Potter books as they were published. If the “Golden Age” didn’t start until the ’40s, what do they call the ’30s, when the mag was born? Either early years or pre-golden age, I guess. I read the new Michael Harvey-Pulse which was fine but not great I’d give it a B. Also read Charlesgate Confidential by Scott von Dovial. A first novel. Published by Hard Case. I would give it a B+. Now I am reading The Long and Faraway Game by Lou Berney. I have a arc of Astounding on my tbr pile. Never read Astounding. By the time I started reading SF magazines it had become Analog. Mostly remember John Schoenerr’s covers. Don’t remember many stories from that time period other than ones by John H. Schmitz. Some of which were pretty good. I remember preferring F&SF and Galaxy. I suppose it depends on which magazine one starts with, what preferences on has later. After you read Astounding, I’ll be interested to see what you think. Jeff seems to think I was unfair in my review. Nah. I first read ANALOG, and liked ANALOG but liked F&SF better than everything, and FANTASTIC nearly as well, since I always liked fantasy and particularly horror as much as sf or more. But ASF and AMAZING and GALAXY and ASIMOV’S and DESTINIES and CRANK! and CENTURY (and AHMM, EQMM, and MSMM, and NEW MYSTERY and…SHORT STORY INTERNATIONAL and ONTARIO REVIEW and CONJUNCTIONS) among so many others I’d read new, and going back and reading stories from PLANET, STARTLING/THRILLING group magazines, ASF and AMAZING, and others in back issues (and the anthologies and such)…ASTOUNDING published a lot of good and not so good material. Ironically, I think the Hubbard material in Nevala-Lee’s ASTOUNDING will drive sales of this book. You would think that Heinlein and Asimov (much better writers than Hubbard) would be remembered today…but no. It’s Hubbard and his kooky religion that’s a driving force in contemporary society. I’m reading some Big Fat Anthologies (500+ pages). In the On-Deck circle are Christmas mysteries. Diane will start playing Christmas music on Thanksgiving. Can’t agree about Asimov and Heinlein, both wrote some novels that are considered classics of the genre and thus are still known, though today’s SF readers seem to only focus on what’s been published within a five year window. I just got Penzler’s The Big Book of Female Detectives which is indeed a fatty. I may wish I’d gotten it in Kindle format. It takes me forever to read these big fat anthologies, as I don’t try to read them straight through. It’s about time for me to get back to the Big Book of Christmas Mysteries, which I read some of every November-December. One of these years I’ll finish it! That’s too early for Christmas music, but as I recall you put up the tree the day after Thanksgiving, so I suppose the music goes along with that. Still, how many times can you stand to hear “Jingle Bells”? The Female ebook is on hold. Coming soon. I tend to agree with you here, Rick. Asimov and Heinlein aren’t as popular at they were in the ’80s, but are still popular…and part of what sold Nevala-Lee’s book to the publishers is that Scientology is Definitely in retreat. George, has she dug the decorations out yet? I don’t really think it’s fair for you to rate a book based on what you wanted it to be rather than what the title says it is. I mean, yes, you wish it was something else but if that isn’t the book the author set out to write, I don’t understand the criticism. Of course, I never read the magazines back then so I don’t really have a rooting interest either way. We were in New Orleans all week so I didn’t exactly have much time for reading. I did read WHAT COULD POSSIBLY GO WRONG? by Jodi Taylor, a fun entry in her Chronicles of St. Mary’s series. And I read a bunch of short stories by O. Henry. I also read some more in THE FUTURE IS FEMALE! collection. I am picking up the new Lee Child at the library today, so that will probably jump the line ahead of others on the shelf. Jeff, I didn’t “rate” it, I simply expressed my disappointment. The title led me to expect one thing, the book delivered something else. I just said so. I stand by my review, which is simply my opinion. I think I said before I’m way behind on the Jodi Taylor books, having liked the first two or three, then getting sidetracked. Barbara is in line for that Reacher as well. Diane has just started to “Christmastize” our home. We’ll be putting up the Christmas tree on Thanksgiving (our long time tradition). That’s when Diane starts playing her Christmas music (we have about 100 Christmas music CDs). I’m on a waiting list at the Library for PAST TENSE, the new Lee Child book. But, I also have a large stack of Library books to read so I’m in no hurry for the latest Jack Reacher. Oh my. We haven’t even “Thanksgivinged” our place, though that’s only a fake horn of plenty and a dried arrangement. Christmas decorations will come out – maybe – around December 10th or so. We do less every year, and are happy with that. I’ve got about 50 holiday CDs, but last year I didn’t even take out the box, just streamed what Amazon music made available. It just seems Christmas is more work than worth as the years go by. We do still send Christmas cards, though. Oh, this is too bad, though good to know! It is funny, though I am younger, discovering these old magazines (which my grandmother had) is what got me into scifi — similar beginnings. The old Astounding, Galaxy and Fantasy & Science Fiction were a lot of fun to read. We noticed today several houses that have already – days before Thanksgiving, when, I might add, there are still tardy people who have not taken down their Halloween decorations yet – achieved full outdoor Christmas displays, one including a herd of life size reindeer. This, to me, is crazy. I don’t think even Diane Kelley has done this yet. Also, Lite-FM has jumped the gun and is playing All Christmas Music All the Time and Yes I Mean ALL THE TIME. A herd of full-sized deer, eh? My god. We had our Christmas lights put up a few days ago, but you have to schedule crazy early to get them done at all. It’s just the colored lights on the gutter line, front and one side. Of course we won’t be turning them on for a couple of weeks. Navala-Lee’s book sounds interesting and I’ll probably get top it in the near future. I was late getting to the SF magazines. Digest magazines were just not available locally when I was young but paperback anthologies were, giving the tempting names of exotic magazine titles on the credits page. Mt first favorites were Cele Goldsmith’s FANTASTIC and AMAZING; later I stumbled onto the “big three” — although F&SF was still hard to find at the news stands. I’m currently on the last parts of Megan Abbott’s GIVE ME YOUR HAND, another great read from one of today’s best writers. I did read the latest Reacher by Lee Child and was mildly disappointed because one major plot thread was too drawn out and too simplistic, not to mention that the “gotcha” was blatantly obvious from the beginning. Even the parts with Reacher sometimes rang untrue, but Reacher — when he gets into action — is always exciting. All in all, an interesting book but one that sits near the bottom of the series. My FFB this week was Gordon R. Dickson’s SECRET UNDER THE ANTARCTIC, the second of a three-book juvenile series — a bit dated but a good example of readable juvenile SF of the mid-Sixties. I also finished two Peter Haining horror anthologies, THE GENTLEWOMEN OF EVIL (1967) and LEGENDS FOR THE DARK (1968). These were typical Haining mixes combining familiar stories with harder-to-get tales. Worthwhile collections for horror fans, which you are not. Coming up are Volumes 1-3 of Majorie Lui’s graphic novel adaptation of MONSTRESS.